Waypoint Leasing’s inventory ran the gamut from small models, to large models such as this EC225, which has struggled to find customers since a 2016 fatal accident over Norway. Helicopter lessor Waypoint’s autorotation into a billion-dollar bankruptcy was accelerated when on April 29, 2016 a CHC Airbus EC225 shed its main rotor hub and fell out of the sky over Turoy, Norway. The crash killed 13, lead to the worldwide grounding of helicopters in the EC225 family, and was the final straw on the back of financially strapped CHC; it filed for bankruptcy protection one week later. The helicopter services business, whose fortunes are tightly tied to those of offshore energy exploration and recovery, had been under stress since 2014. Even so, the CHC financial reorganization plan was breathtaking in scope: CHC turned back 90 of its 230 helicopters to creditors within the first 60 days and another 65 in 2017. Helicopters returned within the first 60 days included Airbus EC155 (1), AS332s (18), H225s (20); Finmeccanica (Leonardo) AW139s (19); and Sikorsky S-76s (16) and S-92s (16). Of the 230 helicopters in CHC’s fleet, 153 were leased; 44 from Waypoint, according to documents in the latter’s November 2018 bankruptcy filing. The CHC bankruptcy cost Waypoint $45 million in annual revenues and saddled it with another $28.4 million in associated costs. Before filing bankruptcy, CHC was 53 percent of Waypoint’s business, accounting for $75 million in annual revenue. 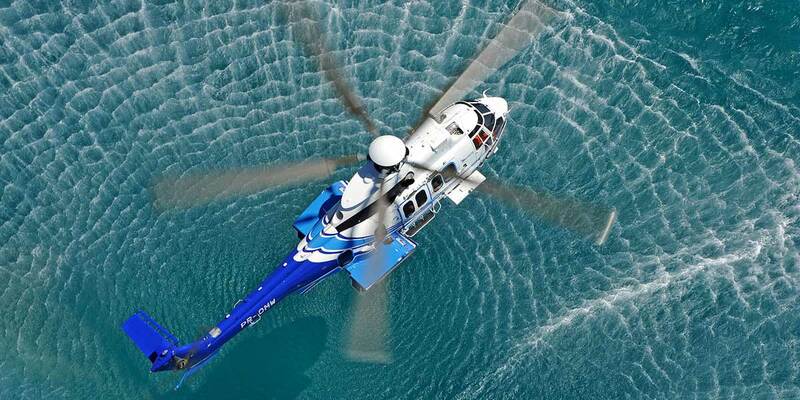 Waypoint noted that the CHC helicopters turned back to it were maintained by CHC’s Heli-One division and in many cases “are in need of significant repair.” Waypoint’s remaining large offshore customers include Bristow Group and Babcock. Altogether, the offshore sector accounts for 73 percent of Waypoint’s aircraft value. By the time Waypoint filed bankruptcy in November 2018, 35 of its 165 helicopters were parked. Five more aircraft are scheduled to come off lease by the end of 2018. Waypoint’s helicopter fleet consists of 25 heavies, 3 super-mediums, 73 mediums, 41 intermediates, and 23 lights divided across 17 different models and four OEMs with an approximate book value of $1.5 billion. Sikorsky accounts for 40 percent, Leonardo 33 percent, Airbus Helicopters 24 percent, and Bell 3 percent. Waypoint’s leases require all customers to enroll their helicopters in hourly maintenance programs. The heavies include six Airbus H225s that cost Waypoint $156 million for which it has not been able to find homes after the Turoy accident. “There is currently little to no demand for the H225 model aircraft from the debtor’s customer base,” the bankruptcy filing notes. Waypoint’s bankruptcy potentially adds to the offshore industry’s decline, glut of helicopters already on the market, and the reduced utilization rates and revenues from the aircraft that remained in operation. Weak energy prices, coupled with an aggressive expansion plan, threw Waypoint into a sea of financially toxic math. Waypoint noted that its overall revenues declined by 12 percent between 2016 and 2017, that fleet utilization rates had declined to 78 percent from 94 percent to 100 percent as late as the 2013-2015 period, and that weighted average lease terms were down to just 2.2 years from 3.1 at the end of 2016. Year to date, Waypoint says it has lost $50.2 million on revenues of $95 million. In 2016, Waypoint was leasing 121 aircraft that generated $135 million in annual revenues; by November 2018 it was leasing 165 aircraft that produced just $106 million in annual revenues. In its bankruptcy papers, the company acknowledges, “The strain on the company’s net revenue has been further exacerbated by the debtor’s extensive orderbook obligations,” noting that it has made $19 million in payments on obligations of $35 million in pre-order payments out of a total of $175 million in remaining obligated pre-order payments. Through October, the company had assets of $1.62 billion, largely in the form of aircraft, and liabilities of $1.23 billion, a goodly part of that multiple nine-figure loans from the world’s largest banks including SunTrust and Wells Fargo in the U.S., BNP Paribas in France, and Sumitomo Mitsui’s Brussels branch. The company was founded in 2013 with $375 million in seed money from investment entities controlled by billionaires Michael Dell and George Soros, along with Cartesian Capital. Waypoint began looking for a way out as early as 2016. An attempt to sell the business to an unnamed Chinese entity “at a premium to book value” failed after a 14-month dance. It received a settlement from Airbus related to the H225 groundings and a modest capital infusion from investors. Earlier this year it attempted to negotiate for better terms, including repayment forbearances, with its two dozen lenders and to implement internal economies, but as energy prices failed to hold, not even this was sufficient. Last summer the company again put itself up for sale and also prepared for bankruptcy, as a means of facilitating the sales process.